Dome of Oceanus from Chef Josette on Vimeo. Chef Josette arrived in Los Angeles on July 4, 1985, with no idea she would embark on a journey of bringing to America her Charcuterie experience. When Chef Josette was 13 years old, she began learning the art of cooking, food, preparation and butchering. However, most importantly, she learned customer service from the family business. At age 18, she purchased the family business from her father and was on her way to create a food empire. Her first business endeavor in America was producing Normandie Pate along with a variety of sausages and other meat products. 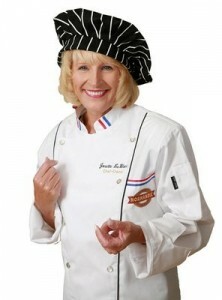 Chef Josette owns and operate Normandie Bakery for wholesale and retail. Inside the bakery is her boutique-style French restaurant called Josette’s Bistro and now the Culinary Institute, her cooking school. Chef Josette’s restaurant-bakery has been know as one of the premier French bakeries in Los Angeles since 1985 featuring a variety of breads, croissants, pastries, cakes, and pates.